The CRKT M16-13DSFG features a slim profile open build InterFrame handle with Desert Tan G-10. The dual hollow ground Tanto blade has Veff serrations and the two Carson Flippers give this knife a true hilt design. 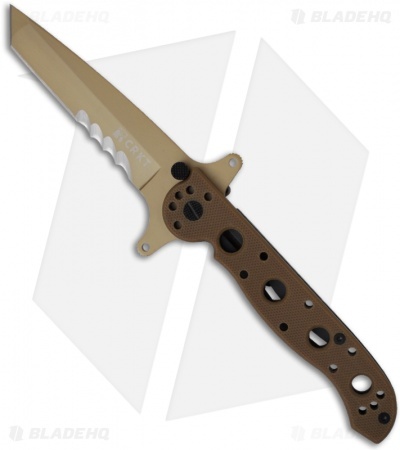 The M16-13 offers quick and smooth one-hand opening and closing. 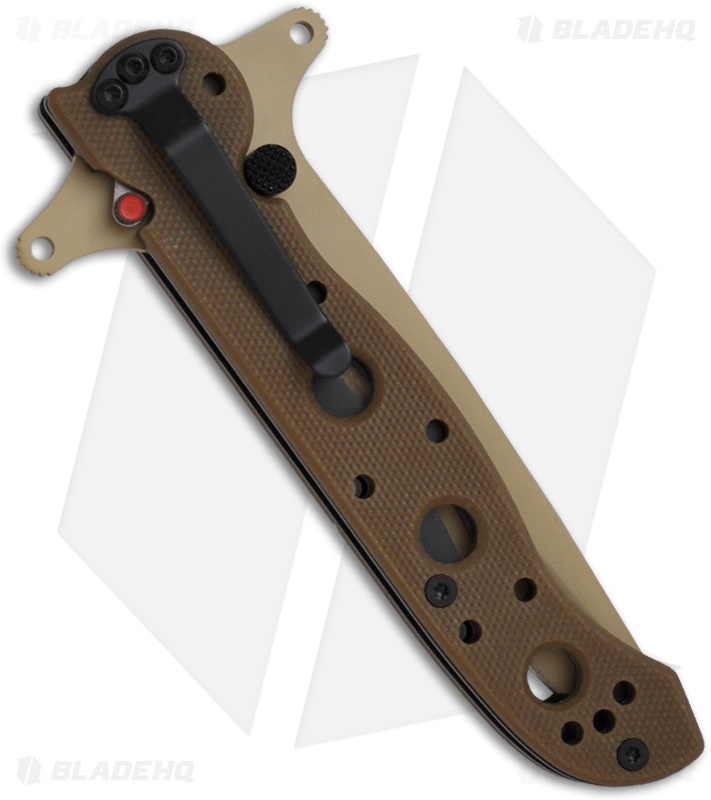 It also features AutoLAWKS safety, which turns the folder into a virtual fixed blade automatically. The pocket clip is 4-way reversible for every possible carry type, but not designed for tip-up in-pocket carry. One of the best knives I've ever bought, I find myself using it more than any other in my collection. The locking mechanisms are perfectly solid, they are not lying when they say it feels like a fixed blade. The double flipper design has a hidden feature: if you wear it tip-up in your pocket, you can hook the second flipper onto the back of you pocket as you come out and it will deploy automatically, without actually having an automatic mechanism. This is great for blue state residents who can only carry manual folders. The color of the blade is goldish/bronze like the finish on a SCAR rifle, and the handle is dark earth. The veff serrations are the best part of the knife and the main reason why I use it so much. The small points are perfect for tiny precision cuts, and the 45 degree angle allows you to hook underneath things and pull toward you for great leverage. I find that there are many types of cutting that I can only achieve with these serrations, so I'll never go back to the regular kind.